Tag line: "The World's Most Honored Motion Picture"
Made at a time when historical epics were commonplace, William Wyler's Ben-Hur remains the greatest of them all. Along with its moments of spectacle (including a battle at sea and a fiercely exciting chariot race), Ben-Hur tells the gripping story of a man tortured by conflicting loyalties, searching for answers in a world that is equal parts splendor and barbarity. What should have been a fond reunion between childhood friends is anything but when Messala (Stephen Boyd), a newly appointed Roman Tribune, asks boyhood pal Judah Ben-Hur (Charlton Heston), a Jewish nobleman, to help him squash a rebellion against Rome, which has been gaining strength in Judea. Unwilling to assist his people's conquerors, Ben-Hur refuses Messala's request, leading to a fissure between the two that results in Judah's imprisonment. Sentenced to serve in the galley of a Roman warship, Judah eventually saves the life of the vessel's commander, Quintus Arrius (Jack Hawkins), who's so grateful that he adopts Judah as his own son. Now a free man, Judah returns home to confront Messala, and to learn the fate of his mother (Martha Scott) and sister (Cathy O'Donnell), both imprisoned at the same time he was. Despite the pleas of his former servant, Esther (Haya Harareet), Judah cannot let go of his anger, going so far as to face off against Messala in a highly-dangerous chariot race. But times are changing in Judea, and the teachings of one man might prove enough to convince Judah Ben-Hur to quell the hatred in his heart. The most famous sequence in Ben-Hur is undoubtedly the chariot race, in which Judah Ben-Hur and his team of four white horses challenge Messala, whose black steeds have guided him to victory on many occasions. Shot on location in Rome's Cinecetta Studios, the outdoor sets built for this scene alone were, at the time, the largest ever constructed, and their sheer magnificence remains impressive even to this day. As for the race itself, I would easily rank it as one of the most thrilling moments in cinematic history. To try and do it justice by way of a few, measly words is an act of futility; it must be seen to be believed. 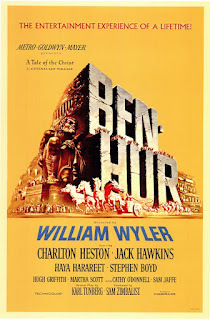 Just as strong as the film's larger-than-life sequences is the character of Ben-Hur, played so well by Charlton Heston. At the outset, Judah is a proud member of the Jewish nobility, a kind man who feels he has no choice but to turns his back on his closest friend. The scenes with Messala at the film's outset are a sharp contrast to what happens later on, when Judah saves Quintus Arrius, a man he initially despises, and becomes Arrius' adopted son. Having earlier refused his friend, Judah now embraces his enemy, and for a short time, even lives as if he were a Roman. Yet his journey is not finished; Judah Ben-Hur will face many more obstacles, many more questions in the search for his own identity. Ben-Hur is a film that's impossible to overpraise; from the magnificent performances of its supporting cast to Miklos Rozaa's stirring score, it is the movie by which all other Hollywood epics are measured. And as far as I'm concerned, none have come close to it. My fave movie of all time. @kerry: It's not my all-time favorite, but I do love the movie! Ben-Hur is one of those movies that are perfect and should NEVER be remade or rebooted (although it didn't stop some idiots from trying recently). As you mentioned, the chariot race is spectacular, it's my favorite scence in the film. I also liked Hugh Griffith as the comedy relief sheikh.